MPs: Crorepatis or underpaid public servants? Color of Terror: Saffron, Green or Black? New Delhi: A robot performing surgery sounds like a scene out of a Hollywood sci-fi flick. But fiction is fast turning into reality in Indian operation theatres where high-precision robotic surgeries - a less cumbersome procedure than conventional operations - are gaining acceptance. Leaving behind the days of low technology methods, doctors are now ushering in a new era of medical treatment successfully. Robotic surgery in Delhi's premier All India Institute of Medical Sciences (AIIMS) is one of the success stories. 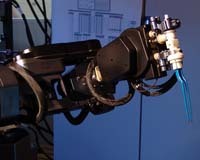 The robot consists of a set of four arms, two to operate, one to hold the camera and the fourth one for assistance. These arms are mounted on a platform and are controlled by the doctor sitting at the control panel. The panel consists of an eye piece which gives a three-dimensional view and two joy-sticks to move the robot's arms. The movement of the robot's hands is same as that of the doctor, making the procedure simple. "Laparoscopy's shortcoming is that the camera fitted at the instrument provides only a two-dimensional view and hence the dimension of depth is lost," he adds. On the other hand, the camera used in robotic surgery has two lenses - giving a lifelike or 3-D picture. Its other advantage is that the arm of the robot has a 360-degree movement - just like a human hand, while laparoscopic instrument's arm has a unidirectional movement. "Robotic surgery gives the best of both - open surgery in terms of 3-D view and laparoscopy in terms of smaller cuts," he said. The chest surgeries performed by robots are mainly for Myasthenia Gravis - a disease characterised by nervous and muscular weakness. Usually these operations leave a deep scar on the chest of the patient - making it medically complicated as well as a stigma. In the robotic surgery, the long cut is replaced by three small holes which are barely 10 mm to 1 cm in size.